In a world where we’re bombarded with advice on going green, authors Mark Townsend and David Glick take a refreshing line and tell us how NOT to go green. Indeed, they’re here to help us f**k up the planet good and proper. And it’s easier than you think. 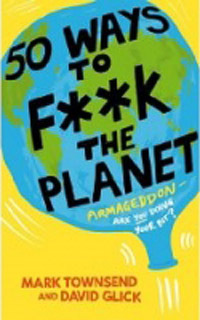 An irreverent celebration of environmental doom and gloom, 50 Ways to F**k the Planet takes the ‘eco-handbook’ in an outrageous new direction, exposing fifty very real and very scary threats facing the world today and showing just how entertaining and easy it is for us to make them worse. Forget the future. Why expend our energy on a lost cause? This is the defeatist (but not altogether unrealistic) stance taken by Townsend and Glick as they revel in the dire fate of our planet. Combining bleak facts with hilariously ironic commentary, the authors applaud our environmental incompetence and stick two fingers up at the whole damn thing. Punctuated with checklists and handy hints to f**k things up faster, this book is for those who want to stop pretending they are responsible world citizens and just get with the party. How much you get involved is up to you, but don’t be fooled into thinking that doing nothing is any better.From the familiar bumblebee, whose dwindling numbers has huge repercussions on our food chain, to the environmental implications of the smoking ban, the topics cover endangered species and declining terrain as well as social (mis)conduct and the devastating effects of commerce. Outspoken and unabashedly brazen, this is your ultimate countdown to the end of the world. A fresh approach to serious issues, this is one book about environmental issues that people should read. I wholeheartedly support this book. It's a clever way to get people thinking about our future. What a refreshing read. A really amusing book with green credentials that doesn't preach. Hallelujah!